The 2019 ACC Tournament champion concluded Saturday, as No. 3 Duke defeated 4-seed Florida State 73-63. Zion Williamson was named the tournament's Most Outstanding Player. 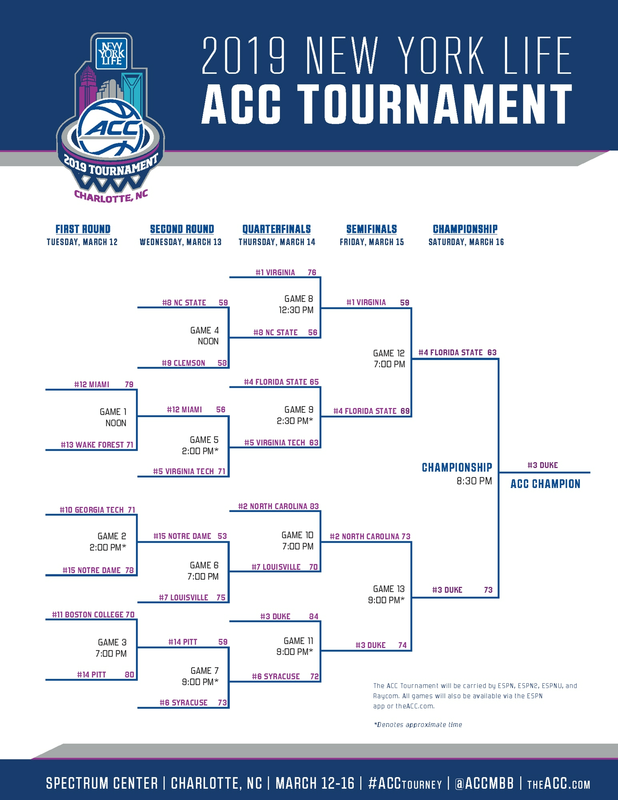 Here is the full ACC Tournament bracket, schedule, scores and seeds information. Click or tap here for a live ACC scoreboard. You can also click or tap on any of the links below to be taken to the scoreboard for that game. All 15 ACC teams will compete in the tournament. Seeds 5 through 8 had a first-round bye. The remaining seeds began play in the First Round on Tuesday, March 12.